2. Click the "+ Add" button. 3. Go to the Integrations tab and click the Connect button next to the Attendify Registration. 4. 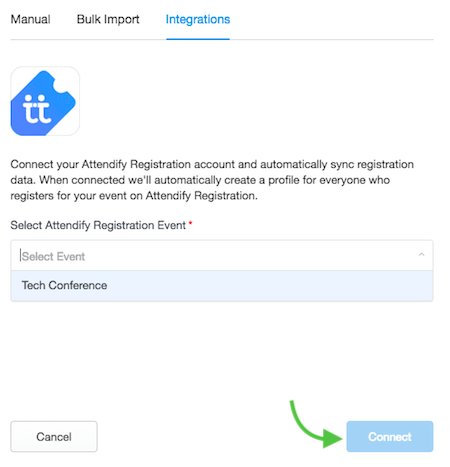 Select the Attendify Registration Event you'd like to connect and click Connect. That's it! Profiles for the attendees who have already registered for your event will be created in the app within a few minutes. The system will automatically create a profile for each new participant when they register. This process is almost the same as for a single event app except the integration is being set up on the container level. However, you can choose which event within your multi-event app to pre-join users from the Registration integration. 1. Go to the People section of your dashboard and click the "+ Add" button. 2. 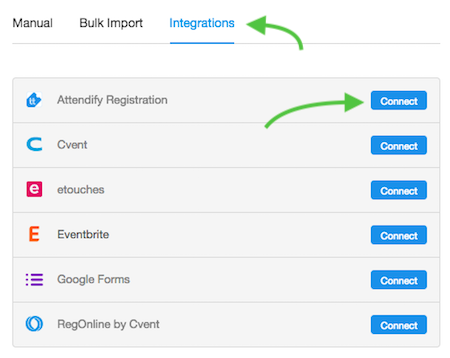 Go to the Integrations tab and click the Connect button next to the Attendify Registration. 4. 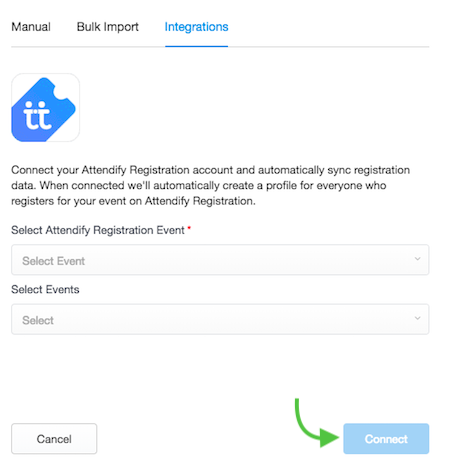 Next, select the Attendify Registration Event you'd like to connect and/or the event within the app you want to automatically pre-join the profiles to. Click Connect.